Today I found out the can opener wasn’t invented until 48 years after the invention of the can. In 1795, Napoleon Bonaparte was having problems with his supply lines. Specifically, they were too long for the food preservation methods at the time, making it difficult to adequately supply his troops with needed food. Thus, he offered a 12,000 franc prize for anyone who invented a preservation method that would allow his army’s food to remain unspoiled during its long journey to the troops’ stomachs. In 1810, Nicholas Appert won the prize for his method of keeping food fresh by sterilization. Although he didn’t understand exactly why it worked, Appert found that food stayed fresh for long periods of time if you could seal it tightly in a container, in his case a glass jar, and then heat it up. Later that year an inventor, Peter Durand, received a patent from King George III for the world’s first can made of iron and tin. Combined with Appert’s sterilization method, long term canned food preservation became possible. While the method for keeping food fresh was now there, Napoleon’s troops had difficulty actually getting at the food. The early cans were far too thick for any dedicated can opener. As the Donner Party taught us though, hungry men will find a way to eat. So as you might imagine, early cans were opened by brute force. The age old “smash it with a hammer and chisel” technique was commonplace. Not the best method in the world for keeping one’s food un-mashed, but nevertheless got the job done. These early cans could only be produced at a rate of about 6 per hour, though, even with the most skilled workers, so they weren’t widely adopted by the masses in the beginning. Fast forward a few decades and, in 1846, Henry Evans invented a die method for making a can from a single motion. This increased production to about 60 cans per hour, a drastic improvement over previous methods. One year later, Allen Taylor patented his machine stamped method of producing tin cans. As these methods were perfected, allowing for thinner and more rapidly produced cans, cans began to be more widely used and, because of how thin they were becoming, it became possible to produce a dedicated and practical tool for opening them. The first such tool popped up in 1858, almost a half century after the can was invented, when Ezra Warner patented the first dedicated can opener. This design became known as a “bayonet and sickle” type can opener. It worked by puncturing the can with the bayonet portion, and then the sickle portion would remove the lid. The opener left extremely rough edges and so never really caught on, long-term. Another early design, in 1866, was made by J. Osterhoudt. His patented design combined the opener and the can in one. Specifically, it was a tin can that came with its own key opener. This is similar to the kind you still see sardines packed in today. The can opener that most of us still use today was invented in 1870 by William Lyman. His original design had a simple wheel that rolled around the rim of the can, cutting it open as it went. The Star Can Company made the final design change to this beloved method by adding serrated edges to the wheel. The first electric version of this design wasn’t produced for over a half century later, in December of 1931. The Napoleonic Wars didn’t just help spark the invention of a better food preservation method, but also of the modern day pencil. During this time, France wasn’t able to import pencils from Great Britain, which had the only supply of pure solid graphite in the world. Nicholas Jacques Conté, who was an officer in the army, discovered that if you mix graphite powder with clay, you can then form this mixture into sticks and fire this substance in a kiln. You also can vary the clay/graphite ratio to achieve different levels of hardness and darkness. For the first time, this allowed for the making of high quality pencils without the need for Britain’s pure graphite sticks. This also is more or less exactly how pencil cores are made to this day. Read more about Conté and why you used to have to use #2 pencils on scantron forms here. If you placed every can produced since 1972 end-to-end, you could reach the moon and back almost 500 times. Recycled aluminum cans can return back to a store shelf in as little as 60 days from when they last left it. It takes approximately 95% less energy to produce an aluminum can from recycled aluminum than it does to make it from aluminum ore. Estimates have it that recycling all our aluminum cans could save 18 million barrels of oil, or about 10.8 billion kilowatt hours of electricity, than if we created those cans from ore.
Aluminum cans continue to become lighter as technology and manufacturing techniques progresses. One pound of aluminum can make about 30 cans. 20 years ago, that same pound would have only produced 20. Botulism is a type of food poisoning caused by the bacterium Clostridium Botulinum. One teaspoon is enough to kill approximately 100,000 people. The illness has been commonly linked to poor canning techniques, often performed by amateur canners at home. Clostridium Botulinum thrives in moist environments lacking oxygen. It is present in soil, raw fruits, vegetables, and on meat and fish. It takes about 240°F to kill these particular microbes. Since water boils at 212°F, these bacteria require a pressure canner to adequately ensure its demise. Should the process of pressure canning not be followed appropriately, when the contents of the can are consumed, the illness takes hold and you may die! Up until the early 20th century, it was common for can lids to be hand soldered on after the food was put in to seal them. One hopes not with lead-based solder, but I’m guessing they probably were! The easy open aluminum can top was invented by Emie Fraze in 1963, which drastically increased the use of cans for beer and carbonated soft drinks. Before the easy open top was invented, canned soda and beer was opened with a triangle tool that would puncture the top of the can. I saw a sound clip in my feed reader while reading an article, but now it’s gone. Do you know what it was? @Mushyrulez: How odd :-). I have no sound clips on this site at the moment that I know of, so I’m not sure. Cool article. I would have only enjoyed it more had you written the scientific names correctly. Its just a pet peeve of mine, but it sure makes them look nicer. I also didnt love the phrase, “the illness takes hold” since botulism is an intoxication rather than an infection, (in adults) but that may just be a matter of taste. Who uses a can opener in that way? The opener should be held horizontally with the serrated wheel gripping the top lip of the can and the cutting wheel effectively ‘slicing’ the top of the can off, leaving a nice clean cut. Poyet. The pic is not odd. Pay attention! Always look carefully before you make a critical comment. 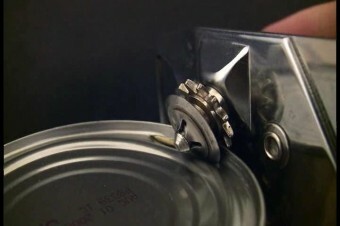 The type of can opener shown IS being used correctly. The instructions you give apply to a more recent design, and your suggestion could not even be carried out with the older design. Neither is very good, as they cut through the lid along the INNER edge. I prefer the design that came after these two, which has a small cylinder carrying a raised ‘blade’ around its circumference. This is pressed into the outside edge of the lid (which is formed by folding the metal of the lid over the metal of the can) shearing this single layer as the can turns, and allowing the lid to be lifted off (it can even be replace, and used as a lid). Because the separation takes place on the OUTER edge (rather then the inner), there is no way for metal shavings or dirt on the lid to fall into the contents and contaminate them. It was Franklin. Charting the Northwest Passage. So, Clostridium Botulinum survives in water even if it is boiled? Then, there is a common notion that anything boiled is safe to be taken as food. Is it true ? I think it spores that may survive boiling. A tedious distinction, but some things may have to be “boiled” under pressure which cranks the temperature up a bit. I’m holding Lyman’s original blue prints of the invention of the can opener as I read this article!